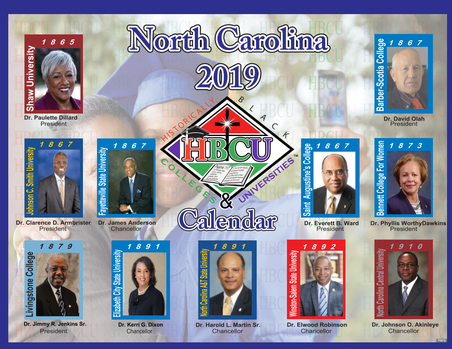 Each edition of the “Living Legends” Calendar showcases outstanding alumni of the 11 Historically Black Colleges and Universities (HBCU) in North Carolina. Typically, honor is bestowed upon deceased alums however, our goal is to recognize our “Living Legends” and celebrate their accomplishments with them. The 2015 program had a strong focus of servant leader achievers within the U.S. Congress, the NC State Legislator, and local civic service. An additional goal of the calendar is to make our youth aware of the breadth and depth of achievers who graduate from our HBCUs. These educational institutions continue to make remarkable strides in providing challenging, innovative and inspiring diverse learning environments for the youth and adults of America. African American graduates of our NC HBCU are involved in major decision making in all walks of life, from engineering, to education, to healthcare to consumer retail, to financial institutions to aeronautics. We are insuring the national security as well as lifting the underprivileged to higher levels of proficiency. Our sincere gratitude to the education provided by our NC HBCU.